The University of Maryland Medical System Foundation oversees hundreds of funds that benefit our hospitals, centers and departments. Did you know that each fund is different and focuses on a specific need within the medical system? Learn more about our featured fund below! Bob Pohl is alive today, thanks in part to the University of Maryland’s Heart and Vascular Center. A lifelong distance runner, Bob went into cardiac arrest during the half marathon at the 2011 Baltimore Running Festival. He collapsed 200 feet from the finish line, an area —quite fortunately—packed with thousands of cheering spectators. 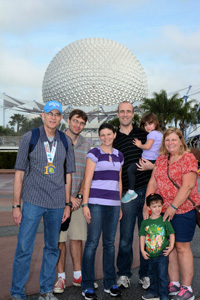 Pictured: Bob Pohl (left) with his family in Disney World in 2015 after he completed the Goofy Challenge—a half marathon followed by a full marathon the next day. “It was only due to extreme good luck that I fell where fellow runners, paramedics, and race medical crew could revive me and get me to a state where I was alive when I got to the Emergency Room,” Bob explains. Doctors at the University of Maryland Medical Center initially gave Bob single-digit odds of survival. He spent the next two weeks in the Cardiac Intensive Care Unit, a 19-bed unit dedicated exclusively to patients in the University of Maryland’s Heart and Vascular Center. Physicians discovered that Bob’s cardiac arrest stemmed from a piece of plaque in one of his arteries that broke loose, causing a blockage. Bob underwent surgery to clear the blockage and place stents in his artery. Doctors put Bob in a coma to facilitate the healing, but were unsure of when—or if—he would wake up. If Bob did come out of the coma, he faced the possibility of brain damage and other long-term health effects. But against the odds, Bob made a full recovery—which he credits to the quick actions of the first responders and the advanced care he received at the University of Maryland Medical Center. Bob and his family are supporters of the University of Maryland Heart Center Fund, which provides immediate resources to the Heart and Vascular Center for priority projects, programs and critical needs. The Heart and Vascular Center has a national reputation for treating complex heart conditions using the most advanced treatment options and therapies. Thanks to the thorough and multifaceted care at the Heart and Vascular Center, Bob could lace up his shoes and run a half marathon seven months following his cardiac arrest. More than five years since the incident, Bob continues to look ahead. His running regime has not slowed down—in fact, he has since completed seven full marathons and 10 half marathons. Bob takes his health more seriously and has regular visits with his cardiologist. He also has a newfound appreciation for his family—his wife, Karen, of 37 years, and their two children and two grandchildren. To support the University of Maryland Heart and Vascular Center, consider making a donation to the Heart Center Fund Area of Greatest Need. Your gift will provide immediate resources for priority projects and programs.